Browse: Home / NME – Network Mapping and Enumeration Framework Released. 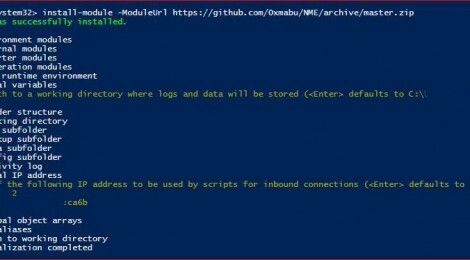 The Network Mapping and Enumeration (NME) framework is a collection of Powershell modules used to gather information about “assets” pertaining to a system environment. Assets currently supported includes networks, computers, services, DNS domains and credentials. The information collected is stored as custom Powershell objects, one for each asset. Objects can be created in multiple ways, such as by importing data from external tools (such as nmap), by running the various enumeration tools in the framework, or by simply creating them manually with built-in helper functions. Once created, the object acts as a structured placeholder for all information gathered for that asset. The objects exists in memory of the current session (accessible through the $NMEObjects variable) and can be parsed and queried using the built-in capabilities of Powershell. Additionally, the object definitions for some assets contains custom member functions that allows for additional actions to be performed on the asset/object. Furthermore, and perhaps more importantly, the objects are supported as input to (most) other enumeration and testing tools in the framework. This means that the objects themselves can be passed as “targets” to the tools over the pipeline, instead of using string input and parameters. Additionally, several tools are written to make use of object properties as part of its parsing logic, and actually feeds the results of its processing back into the object. Also, by supporting in-memory objects as input over the pipeline, built-in cmdlets can be used to parse large collections of targets and only process the ones that match a specific criteria. + External; Modules and scripts from external parties that add valuable functionality to the framework environment. The framework is loaded as a PowerShell module. Place the NME folder in your Powershell module path and run “Import-Module NME”. Run “Get-Command NME-*” to get a list of most commands. Each command has detailed help information available by using the Powershell Get-Help feature. Additional details on the framework, its modules, functions, object definitions, environment and logic will be available shortly. The focus of this framework has not been to write a collection of “hacking tools” that can be used for penetration testing (although, admittedly, it does contains several such tool and it would be very easy to add more tools as this continues to evolve). Rather, the focus was (and is) to create an interactive platform where testers can collect, parse and analyse data from distributed sources in order to understand a target environment. Being able to use that information and directly pass it on to more “hacker-centric” scripts may very well be the next step. Ideally, I would like to create a platform on which other Powershell-based hacking frameworks (such as PowerSploit, PowerView, Posh-SecMod and Nishang to name a few) can be integrated. This framework is the result of me trying to learn how to write code. As such, the code in here will probably not be the prettiest, nor the fastest you will ever see. Hopefully it will evolve over time though. Any feedback and contributions will be gladly accepted! I have a million ideas on what I want to do with it, so stay tuned. A final disclaimer/warning – the code here is largely untested and probably contains a lot of bugs. Use on your own risk. ← T2-PacketSpammer : is a wifi packet injection utility.